Hey, guys. I'm new here and I haven't really introduced myself because I don't have a dog. I really want one, though. It is (and has been for a long time) a dream of mine to have an OES, but there is one thing... I have a kitty, Frida. She is a 4-year-old cat, 100% indoor cat that is probably the most spoiled rotten kitty there is. She doesn't accept strangers, not even the vet. She is grumpy and the queen of this house. I adore her, but I also want an OES puppy, the thing is... I just wish I knew she will accept him. I don't want her to feel rejected or jealous. Even worse, I don't want them to hurt each other or something horrible like that! So, I am looking for opinions, at the cat forum I am at and here, what a better place if this is the breed I adore. Should I probably just stick to having Frida? 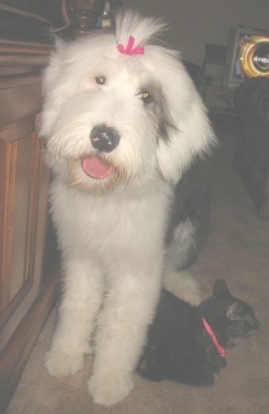 I adore her, and I would quit to my dream of having an Old English Sheepdog as long as she is OK, but I would also love SO MUCH to have the puppy if it were possible. Any suggestions? IMO, your kitty will feel hurt and feel jealous. ...but many pets go through that! You described the queen kitty in our house. She absolutely hates people, hates anything other than mommy. She is fussy, likes to attack my husband whenever she gets picked up, and beat up on visitor animals. But then we got our happy go lucky OES puppy!!! Her feelings were hurt that this cat didn't like her, but she would try, try, try. Would step over her EXTRA CAREFULLY, while not looking twice as she steps ON everything else. 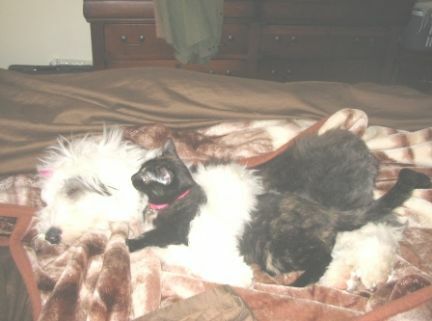 Our OES would be real quiet and stay still whenever the cat was still because she was SO eager to be friends wtih the cat. The persistance finally paid off because the cat realized the dog wasn't going anywhere, so she would have to "let her" stay. The first week the dog was in the house, I remember my cat taking her anger out on everyone. She would hit and hiss at me, and be super growly. It took a month before I saw even a little HOPE for a friendship. Then even longer for them to be sharing the same bed. Before all that, I thought I made the worst decision ever. I didn't know what I got myself into!!! I just comforted my cat and made the dog sleep in her crate. I made sure the CAT had most of the house and slowly gave the dog more room to run ...until then, she was gated in the kitchen. 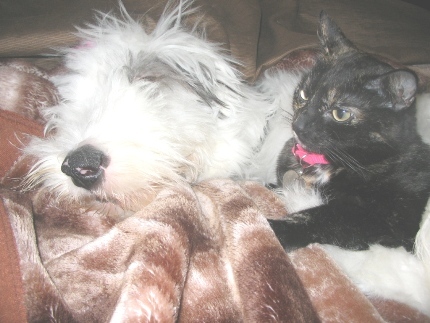 What helped, imo, was finding a breeder that raised their dog with cats especially if you choose an older dog. Of course this isn't necessary, but I think it helped. I think your kitty will learn to adjust to the new relationship in your house as long as you are prepared that the home structure will change. We have two kitties that we love and adore, but Bingley pretty much rules the roost right now just because we have to watch him all the time! At first for potty-training, now to make sure he chews on the correct things, minds his manners, etc. Eventually I think things will slow down to a normal pace as he grows older. In order to give our kitties their proper time we have learned to focus on them when we put Bingley in his crate for some rest time, or at night when he is in his crate to sleep. At these times we have great kitty-cuddling sessions and focus all of our love on them. They have also learned how to avoid Bingley when he's up and about the house by jumping on tables, furniture, etc. They can be very persistent in letting us know that we need to look at THEM for a bit. All in all it will be a big change for your queen, but if you prepare for it the right way I think you could both benefit from a change in the 'pack'.